LOS ANGELES -- One of the strange things about the sordid Donald Sterling saga is that it felt like more of a national story than a local story. It swept across the country but never completely gripped Los Angeles. It's not as if it involved one of the city's sporting institutions, such as the Lakers or Dodgers. Sterling was a story that was in Los Angeles but not about Los Angeles. Sterling was a national debate but a local discussion. If anything, he provided a respite for Lakers fans in this ultra-frustrating season; they might not be happy with their management, but at least they weren't as messed up as the Clippers' ownership. There was a similar dichotomy between the effect this story had on players across the league and the effect it had on the Clippers. Around the NBA it was galvanizing, a thread that connected players on every team, the proletariat vs. the ruling class. Stephen Dunn/Getty Images After an eventful day, Doc Rivers and the Clippers brought home a Game 5 win. For the Clippers' players, it was more of a draining experience. As much as everyone said Sterling's attitudes were an NBA and even a societal problem, it was the Clippers' burden to bear. They were the ones who were playing on behalf of Sterling -- whether they wanted to or not -- as long as he was associated with the team. 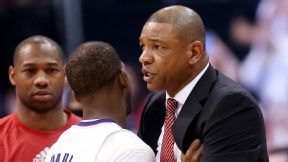 "I kept thinking, 'They didn't do anything, yet they have to respond,'" Clippers coach Doc Rivers said. It was a distraction they didn't need. "In a situation like this," Chris Paul said, "like Doc always says: the clutter. You've got your family members, the social media, everybody telling you what they would do and what you should do." Adam Silver's dramatic news conference and maximum possible sanctions against Sterling generated excitement elsewhere. For the Clippers, it was more like relief. "It put a lot of guys' ... minds at ease," Paul said. No player's numbers had been more indicative of the Clippers' emotional swing than DeAndre Jordan's. He had a purposeful 22 rebounds, 14 points and 5 blocked shots in the Game 3 win on Thursday. In Sunday's Game 4, after the Clippers spent all of Saturday dealing with the Sterling fallout, Jordan posted six rebounds and no points in the dismal loss that evened the series at 2-2. He bounced back Tuesday with monster stats: 25 points, 18 rebounds and 4 blocked shots. He even made 6 of 8 free throws in the fourth quarter, helping to hold off the Warriors in the Clippers' 113-103 victory, which put them up 3-2 in the series. "I think it was all of us," Jordan said. "We can say it wasn't a distraction, but it definitely was a distraction. It showed in our play [in Game 4]. We weren't urgent at all. We were kind of going through the motions up there. But tonight we got back to our task and we got back to focusing on our opponent, which is the Warriors." That sounds exactly like the message Rivers preached after the Clippers got caught up in the officiating in Game 1 and during his nearly impossible task post-Sterling. He gave his players a day off Monday, to let them breathe, as he put it, and hoped that Silver's announcement on Tuesday would provide the necessary resolution. Silver delivered everything Rivers and the players around the league could have asked for, banishing Sterling from everything to do with the Clippers and asking the other owners to vote Sterling out of the NBA. So Silver, in a way, gets the assist for helping the Clippers get the series back in their favor. No doubt, though, it was Rivers who scored the hoop. He became the voice of the organization, handling all media responsibilities and striking the right tone of disappointment, outrage, uncertainty and resolve. "How blessed and fortunate we are to have a guy like Doc Rivers leading us through this," Paul said. "I couldn't have imagined having another guy." Rivers had been plunged into an unprecedented coaching dilemma: how to get your teams through a playoff series while the Internet's afire with audio recordings of the team's owner demeaning African-Americans. It helps to remember that no matter the experience, there's someone who came before you who's gone through worse. Rivers turned to Wayne Embry, who has endured hardships that make Rivers' week look like a trip to Maui. As the NBA's first African-American general manager, Embry had to fight through hateful words -- and even ammunition -- meant directly for him. He opened envelopes that contained messages such as "Black people should be dead" and once returned to his seat in the arena to find that a bullet had been left on it. Embry and Rivers' relationship dates back to Doc's arrival in Milwaukee to play at Marquette as Embry was completing his groundbreaking eight-year tenure as the Bucks' GM. Embry counseled Rivers on deciding whether to leave school early to enter the NBA and has been a trusted resource ever since, right through phone calls this week. Rivers also thought back to the advice he had received from his father, who died in November 2007 at the beginning of Doc's championship season with the Boston Celtics. "He would have told me to go do my job," Rivers said. The Clippers finally went back to business in a surreal workplace. Gone were the giveaway T-shirts that turned Staples Center into a sea of red during the first two games. The organization decided to leave attire up to the fans, and many chose to wear black. Many of the gimmicks on the scoreboard screens were missing, gone with the sponsors who fled to avoid being dragged down by Sterling. But any and all signs and shirts were welcome on the scoreboard, even those with Sterling's face crossed out or even giant heads of Magic Johnson (whose presence on Sterling's girlfriend's Instagram account triggered the recorded argument that was Sterling's downfall). But the fans fully supported the players from the moment they ran onto their court (keeping their Clippers warm-up attire on this time) and provided the home-court edge the Clippers weren't even sure they'd have 48 hours earlier. Together, they got through the crisis. They played a game whose very tipoff was in doubt, with players around the league mobilizing for a shutdown if their concerns weren't met by Silver. And they prevailed. "You can make a bigger statement by doing your job well, in front of adversity," Rivers said. "I know my father would have said that." MVP: DeAndre Jordan bounced back from his worst game of the series with arguably his best. He controlled the glass (18 rebounds), patrolled the paint (four blocks) and even made over half of his free throws (9 of 17). It's rare that he cracks the 20-point threshold, so he gets Tuesday's honors. That was ... special. After a tumultuous 72 hours and rampant speculation as to how their fans would respond, the Clippers played in front of their most energized crowd of the season. The highlight was a "We are one" chant, which was one of those bone-chilling moments that transcends sports. LVP: Stephen Curry. Although he led the league in turnovers during the regular season, it was odd to see Curry so flustered and careless against the Clippers' aggressive pick-and-roll defense (he finished with eight turnovers). Furthermore, he attempted only 10 field goals and three free throws, a steep drop-off from Game 4. MVP: They won Game 4 without him, but Nene Hilario's presence was a huge reason the Wizards won Game 5 and advanced to the second round. His numbers (20 points, seven rebounds) were solid, but what mattered more was his knack for being in the right place at the right time. X factor: Injuries to Joakim Noah, who didn't look right for the majority of the second half, and Taj Gibson, who left the game with an ankle injury, destroyed any chance the Bulls had to keep this series alive. When Chicago needed a big board, there was no one to get it. That was ... foreboding. Toward the end of the game, the Bulls managed to keep things close, but even a four-point deficit seemed too big a mountain to climb. When they needed a stop and a score, they couldn't get it. MVP: Zach Randolph got a bit of his groove back Tuesday, posting a typical Z-Bo 20 points and 10 rebounds. OKC has struggled to defend the paint all series, and it was no different in Game 5, as Randolph had his way down low. X factor: Mike Miller was on fire from beyond the arc. He hit 5 of 8 3s, often when the Grizzlies desperately needed a basket, be it stifling OKC's monstrous run or giving the Griz the lead in overtime. That was ... exhaustingly historic. No playoff series had gone to four straight overtimes ... until Tuesday. As has been the M.O. for the Thunder-Grizzlies battles, four quarters weren't enough to decide this game. How either of these teams is still standing is nothing short of amazing. DeAndre Jordan, Clippers: Looks like Jordan is enjoying the post-Sterling era. Jordan had 25 points, a playoff career high, and 18 rebounds as the Los Angeles Clippers returned to an energized Staples Center and beat the Golden State Warriors 113-103 on Tuesday night to take a 3-2 lead in their first-round playoff series. D.J. Augustin, Bulls: While John Wall and Bradley Beal lit up the Bulls, Augustin went 1-for-10 from the field in Chicago's 75-69 loss to the Wizards. When the firepower-challenged Bulls didn't get much from Augustin, their playoff fate was sealed. "We stand together in condemning Mr. Sterling's views. They simply have no place in the NBA." 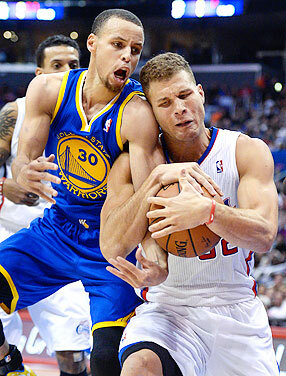 Robert Hanashiro/USA TODAY Sports Blake Griffin and Stephen Curry went head-to-head in Game 5, looking for the upper hand. The Clippers now look to close out the series in Oakland. The Thunder and Grizzlies needed overtime for the fourth consecutive game. It's not only the first time that there have been four consecutive overtime games in a playoff series, it's also the first time that any NBA team has played four consecutive overtime games, whether in the regular season, playoffs or some combination of both regular season and playoffs.